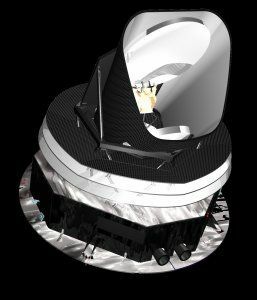 Space observatory designed to observe the fine detail of the cosmic microwave background. Planck reached the Earth-Sun L2 Lagrangian point in July 2009, and had successfully completed a second all-sky survey by February 2010. Cosmic Background satellite built by Alcatel Space Systems (prime), Astrium GmbH, Alenia Spazio for ESA, Europe. Launched 2009. Status: Operational 2009. First Launch: 2009-05-14. Last Launch: 2009-05-14. Number: 1 . Gross mass: 1,940 kg (4,270 lb). Family: Astronomy. Country: Europe. Launch Vehicles: Ariane 5, Ariane 5ECA. Launch Sites: Kourou ELA3. Agency: ESA, Cannes. 2009 May 14 - . 13:12 GMT - . Launch Site: Kourou. Launch Complex: Kourou ELA3. LV Family: Ariane 5. Launch Vehicle: Ariane 5ECA. Planck - . Mass: 1,940 kg (4,270 lb). Nation: Europe. Agency: Arianespace. Class: Astronomy. Type: Microwave astronomy satellite. Spacecraft: Planck. USAF Sat Cat: 34938 . COSPAR: 2009-026B. Cosmic background radiation anisotropy satellite, carried a telescope with a primary mirror of 1.5 meter in size. Mission was to measure the fine structure of the temperature of the cosmic microwave background radiation over the whole sky, leading to a better understanding of conditions at the time of the big bang. After completing a successful mission, the spacecraft was sent into solar orbit and was deactivated. Planck departed L2 on 14 August 2013 and was turned off on 23 October in a 1.00 AU x 1.10 AU x 0.1 deg inclination solar orbit.